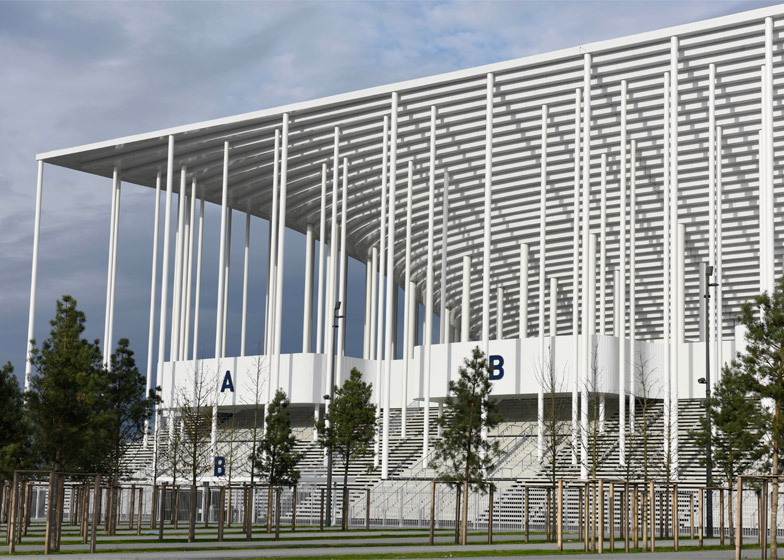 Herzog & de Meuron has completed a monumental new stadium in Bordeaux framed by 900 slim white columns, one of the key venues for next year's Euro football championship (+ slideshow). 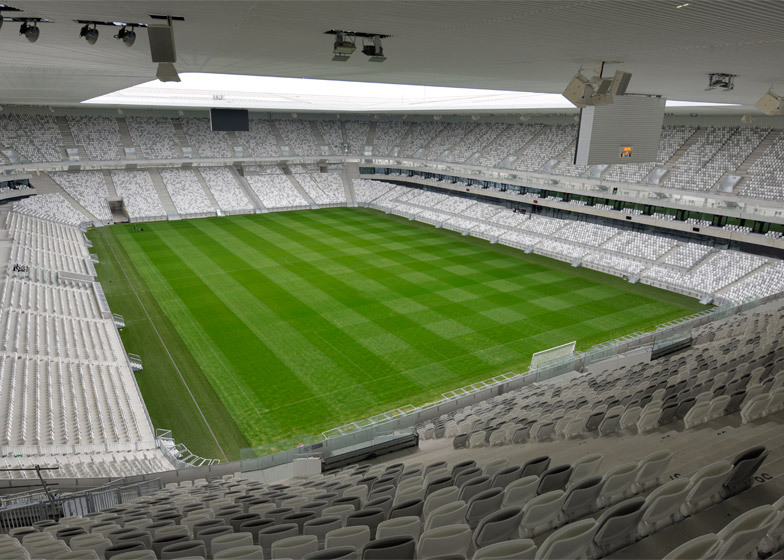 Officially inaugurated on Monday, the 42,000-seat Nouveau Stade de Bordeaux will host five matches during the UEFA Euro 2016 competition, and will become the home stadium of French team FC Girondins de Bordeaux. 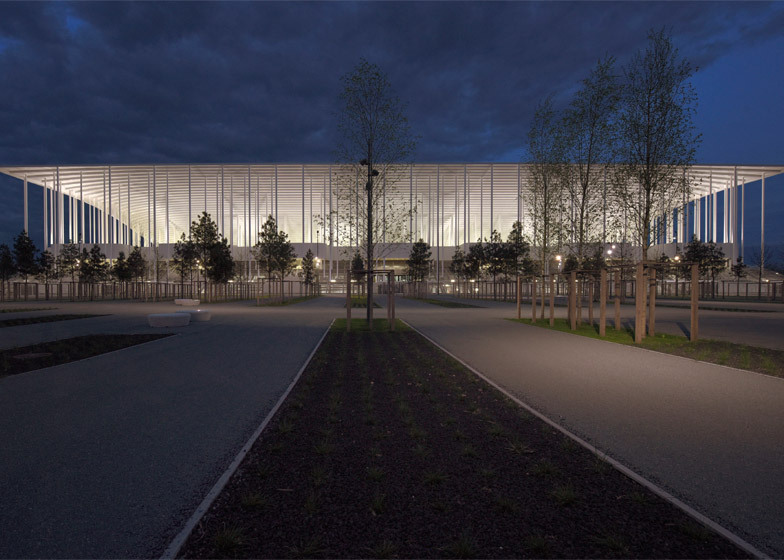 Despite its size, Swiss firm Herzog & de Meuron wanted the arena to feel light and elegant – so it developed a design inspired by the slender pine trees of the Landes Forest, south of the city. 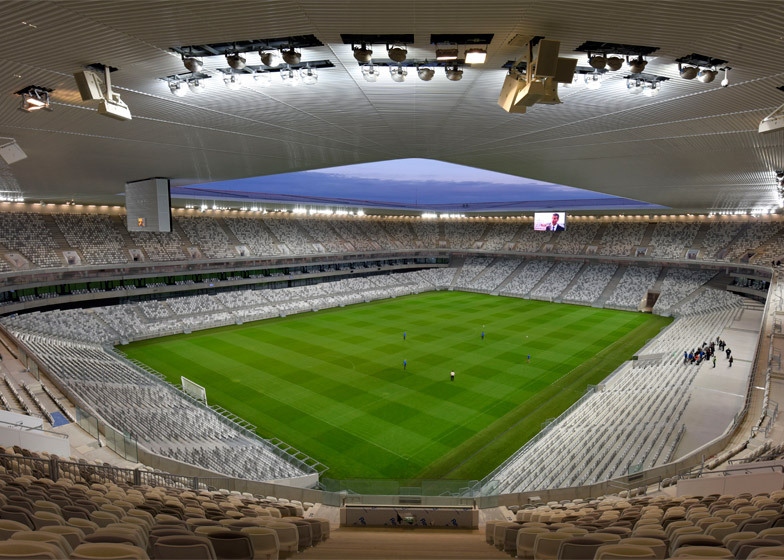 Slender columns support a sharp-edged rectangular roof, which steps down to create the curved bowl of the stadium. This shape appears from certain angles to be mirrored by the grand staircase below, which provides the entrance for spectators. "[The building's] purity and geometrical clarity inspires a sense of monumentality and gracefulness," said Herzog & de Meuron in a statement. 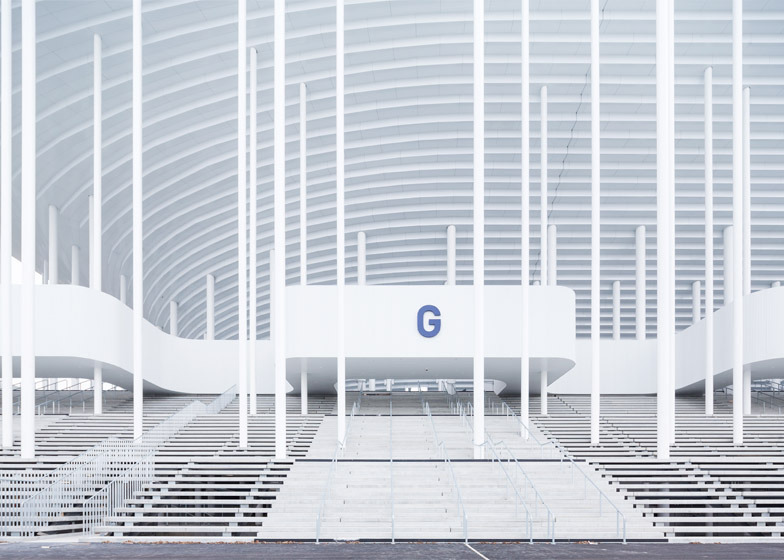 "One might be tempted to draw a comparison with a classical temple, but unlike the elevated plinth of a temple, the grand stairs of the stadium blur the boundaries between inside and outside." 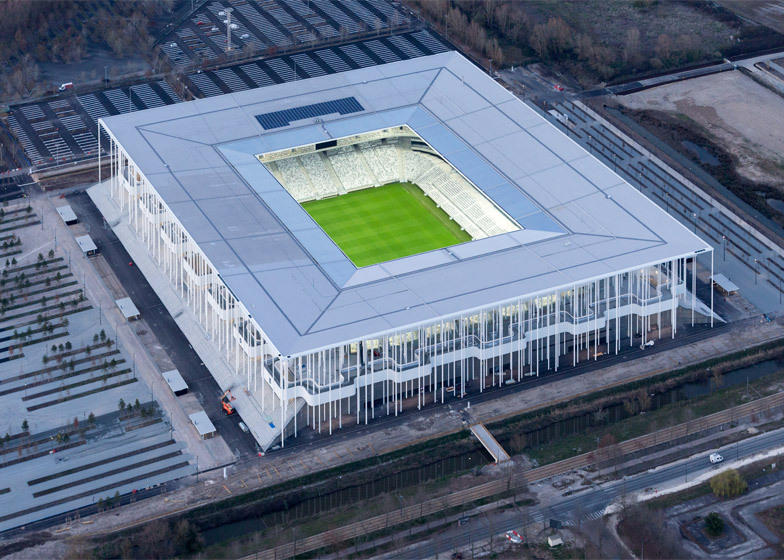 The building is located on the northern outskirts of Bordeaux, next door to the 1980s-built Stadium Vélodrome. This prompted the decision to create a building with geometries derived from the surrounding landscape rather than the historic city centre. 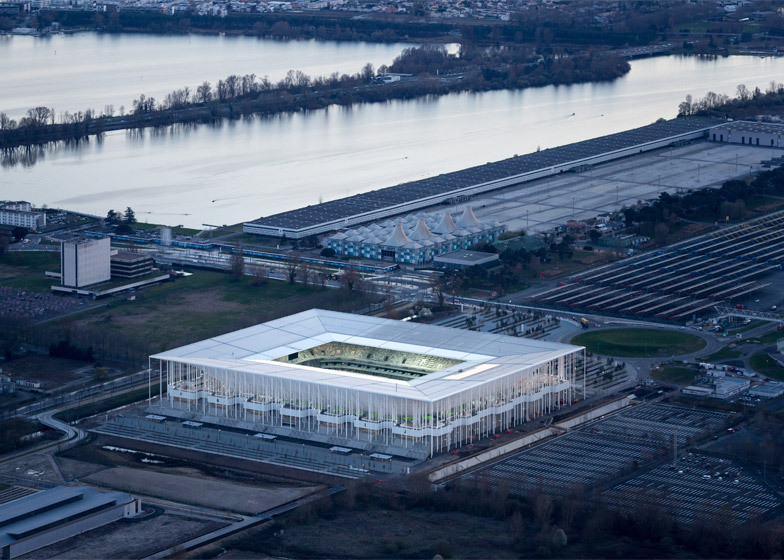 "Special attention was paid to the integration of the structure into the grand landscape," said Herzog & de Meuron. "The meticulous geometrical arrangement of the bowl structure and columns reflects the pattern created by trees and paths." "We were never looking for inspiration in the historical part of Bordeaux," the firm added. "Much of what we perceive as elegance in Bordeaux results from its unity and homogeneity of scale and materiality and from its precision and purity of form. We could not copy this, but we certainly learned from it." The columns surround all four sides of the structure. A large ribbon-like structure weaves back and forth among them to create a series of food stalls and toilet facilities around the perimeter of the arena. The bowl itself comprises two tiers of seating, divided up into four sections. Like most modern stadiums, these seating areas are sheltered beneath the roof, while the pitch is entirely exposed to the elements. The building's structure is not visible from inside the bowl – the intention was to avoid distracting the spectators' attention. Instead, a layer of acoustic panels help to improve the quality of sound. Other facilities, including VIP rooms, media areas and team changing rooms, are contained with a plinth set directly below the bowl. There is also a 200-seat restaurant and a team merchandise shop. "The architectural simplicity and pure lines of the bowl and its base ensure smooth spectator flows and ease of orientation," said the design team. 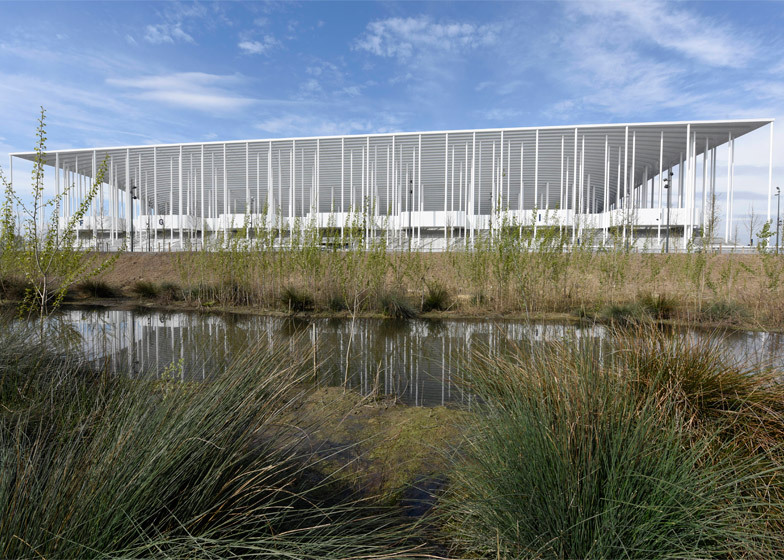 Herzog & de Meuron first unveiled its design for the Nouveau Stade de Bordeaux back in 2011. It will host both football and rugby matches, and will also be used as a venue for music concerts. French landscape architect Michel Desvigne designed landscape improvements around the site, including an area for community sporting activities with basketball and tennis courts, and a children's playground.